As Janet mentioned in her review, she was surprised by how melancholy Peet sounds in his autobiography, so I was prepared for it to some extent. She was right; he is melancholy. Peet had something of a rough start in life, with an absentee father to boot. The book opens with Peet's birth and closes with his success as a children's book writer and illustrator. Yes, he did work for Disney but he didn't really care for Disney, by the way he writes. Working for Disney was an amazing opportunity but was also very difficult. It was interesting hearing his simplified take on his experiences there because after reading How to Be Like Walt (linked to my review) I had the impression that Walt was an amazing fellow who would be fantastic to work for. (By the way, I highly recommend How to Be Like Walt. Loved it so much that I purchased myself a duplicate copy when the one I loaned out didn't come back. But back to Peet, yes?) Peet expresses a great interest in writing and illustrating children's books for himself - to be his own boss. Apparently he succeeded. Truthfully though, I can't tell if he always had a passion to write books for children or if he was trying to defend his reasons for leaving Disney without using too much smack talk. While this is an autobiography, it's extremely short and abbreviated and leaves a fair amount of questions for the reader. The fantastic and most enjoyable aspect of this autobiography are the illustrations, of course. Each page is "littered" with doodles and drawings by Peet. He not only tells his story, but he paints a picture in our heads of what his childhood looked like. There are illustrations of him catching a frog in a pond, romping through forests with friends, spending time on his grandparents farm, etc. As he explains how he used to doodle monsters in his schoolbooks, he covers the page spread in monsters, Peet-style. He relates how he got the job at Disney and how he went from drawing many copies of Donald Duck to becoming a story man himself. I knew he worked for Disney, but I didn't realize that he got "in" with the company during the making of Snow White! He goes way back. ha. As was mentioned in another review which I read on this book, (which I cannot find now - sorry! 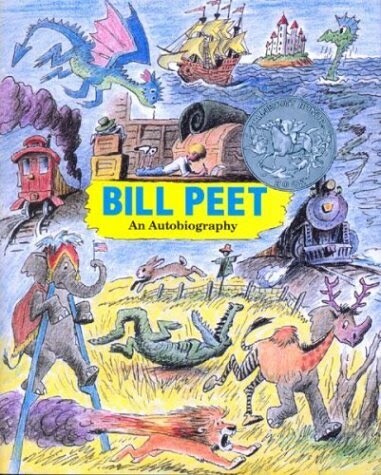 ), Bill Peet: An Autobiography is appealing to children because of the numerous illustrations. When our copy arrived, I didn't actually get to see it for the first few weeks. My boys claimed it for their own and spend a great amount of time flipping through the pages and examining the art work. There was a cry of dismay when I took it to read it for myself. Now that I have finished it, I have given it back. Once again I have found them sitting down, pouring over the drawings. Bill Peet: An Autobiography really is a treasure, just like all of Peet's other works. (That's including The Wump World , even though I think that's one of the weirder stories and is not my favorite.) I highly recommend this as one of the more unique autobiographies you'll ever read and also because Peet influenced so many of the early Disney films that anyone who claims to be a Disney fan really ought to learn more about Peet. He stands alone in a crowd, that's for sure! I just looked over at the book list on his site. I *think* we read some his his books when they boys were little, though I can't remember any of the specific titles. This sounds like an interesting read. The cover certainly catches my eye. I'm going to have to see if the library has this one. Bill Peet definitely is a favorite in our family - my kids DEFINITELY included. Peet was responsible for the drawings for The Sword in the Stone (which sure looks like a Peet book) and 101 Dalmations. He also did the script for The Sword in the Stone. I have always loved his drawings. I would note that the Wumps, like many of his creatures, are inspired by the Capybara, the world's largest rodent. He started in working "randomly" with Snow White (hence the mention in the post). He had more to do with Dumbo - which was awesome because he had always loved drawing traveling circuses. But his style really shines in 101 Dalmations and the Sword in the Stone (as you pointed out) but you can see it in The Jungle Book as well. If I remember correctly, he high tailed it from Disney mid-Jungle Book production. But he was involved in a whole lot - including many shorts, such as Goliath II, etc. My absolute favorite Bill Peet books are No Such Things and Capyboppy. I also have an autographed copy of Pamela Camel (a 6th birthday present from J's wife and her brother - they were also huge Bill Peet fans. Kind of explains a few things.) Ella recommends Jennifer and Josephine, Cora likes Big Bad Bruce, Ted favors The Caboose Who Got Loose and Fritz is torn between Smokey and The Caboose Who Got Loose. I also like how his books help bridge the gap between ordinary length picture books and chapter books for those eager readers. I love how much the witch in Sword in the Stone looks like the one in Droofus the Dragon. Yes, the surprise endings are great! My favorite is probably How Droofus the Dragon Lost His Head. SO...how do you keep a list of all the books/author you want to keep an eye out for? It seems impossible to me! You know those cottonwood seeds that float through the air during the summer? My family calls those fuzzy mopwoggins (that's a spelling guess) because of a Bill Peet book.